Kidney diseases are a critical part of feline medicine, yet we still have so much to learn about disorders of this organ. Thankfully, a lot of research is being accomplished in this area, and following are some of the most intriguing papers recently published. In a pair of papers, Monaghan and colleagues discuss the pathologic background and therapeutic implications of acute kidney injury, the term replacing acute renal failure. Recognizing that this injury has 4 stages helps the clinician understand the course of disease and regeneration. Most important, with prompt recognition, serial assessment, and appropriate corrections to electrolyte imbalances, among other therapies, a favorable outcome may occur. It has long been believed that cats, while not immune to infection with leptospirosis, are resistant to clinical illness. Arbour and colleagues reported on 3 cats clinically affected by this spirochete. All cats had indoor/outdoor access and were known to hunt. Interestingly, they each presented at a different stage of kidney disease (renal insufficiency) but none had hepatic involvement or evidence of other concurrent disease or infection. Two of the 3 cats recovered fully; the other succumbed to complications of renal failure. 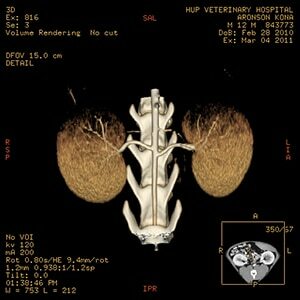 Tubulointerstitial nephritis (TIN) is the most common form of chronic kidney disease (CKD) in cats. Woo and colleagues discovered and isolated a previously undescribed paramyxovirus—feline morbillivirus—that has cytopathic effects in Crandell Rees feline kidney cells in culture. Subsequently, they identified TIN in 7 of 12 (58%) cats with morbillivirus infection, but only identified it in 2 of 15 (13%) cats without infection. While it is too early to conclude cause and effect, the possibility of a viral contributor to such a common disease in cats is an exciting possibility. Finch and colleagues performed a study to determine whether measuring plasma parathyroid hormone (PTH) in clinically normal cats (> 9 years) over time (12 months) would be valuable in early detection of kidney disease. There was significant difference in PTH levels in cats that developed CKD compared to those that did not. Most important, PTH increased before changes in serum phosphate or calcium were seen, suggesting that measuring PTH in cats suspected of having early CKD, or considered at risk for developing CKD, may allow early detection and, therefore, therapeutic intervention. In the nephrology literature, the term acute renal failure has been replaced, for the most part, by the term acute kidney injury (AKI), which allows greater stratification of cases for severity and prognosis and, potentially, earlier treatment and recovery. Initiation Stage: The original insult to the kidney can be caused by ischemia, toxins, infection, neoplasia, obstruction, or effects of sepsis, resulting in direct damage to the renal tubular cells and ischemia. Clinical signs are often absent although the glomerular filtration rate (GFR) falls. This stage can last from a few hours to a few days. Extension Stage: Ongoing hypoxia and the resulting inflammatory response result in this stage, which is thought to last 1 or 2 days. GFR continues to fall as renal tubular cells die and undergo necrosis. Maintenance Stage: During this stage, which usually lasts 1 to 2 weeks, the GFR stabilizes (then rises), cellular repair begins, and uremic complications typically become noticeable. Recovery Stage: Depending upon the severity of renal insult, GFR may fully recover or the kidney may have residual chronic disease. A uniform definition for AKI does not yet exist in the veterinary literature; however, generally accepted criteria include an abrupt reduction in kidney function, resulting in alterations in glomerular filtration, urine production, and tubular function. The incidence of AKI in cats is unknown, but can be caused by a variety of different insults and is not uncommon. A feline staging system adapted from human criteria and based predominantly on serum creatinine has been proposed. Monaghan K, Nolan B, Labato M. Feline acute kidney injury: 1. Pathophysiology, etiology and etiology–specific management considerations. J Fel Med Surg 2012; 14:775-784. Prompt recognition of acute kidney injury (AKI) maximizes the chance of a favorable outcome. Diagnosis should focus on identifying the underlying cause and establishing severity of disease. Cats with AKI may have pre-existing kidney disease, which may be identified during the diagnostic process. 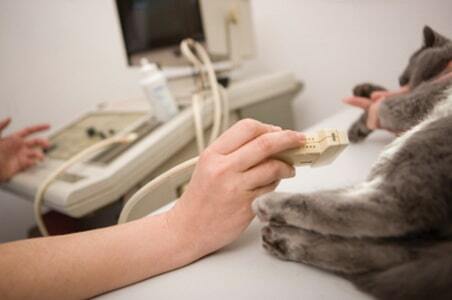 The first diagnostic steps are a thorough history and physical examination, followed by blood analysis. Complete blood count results are often nonspecific but may show an inflammatory or stress leukogram. The serum biochemical profile may be within normal limits but serial monitoring often demonstrates increasing serum creatinine and varying degrees of azotemia and hyperphosphatemia. Potassium levels may be increased due to oliguria, anuria, or postrenal disease. Culture and sensitivity are recommended for all patients with an unknown cause of AKI; however, a negative culture does not rule out pyelonephritis. Since cats with kidney disease are often hypertensive, baseline diagnostics should also include blood pressure measurement and fundic examination; radiography and ultrasound imaging can help determine etiology. Fluid therapy is the cornerstone of treatment for AKI, but care must be taken to prevent volume overload by closely monitoring urine production. Management of electrolyte imbalances, which are frequently seen, is critical. Treatment for hyperphosphatemia includes fluid therapy and administration of phosphate binders; treatment for hyperkalemia is based on electrocardiographic findings. Serum potassium levels can be reduced by several methods, including administration of insulin, dextrose, sodium bicarbonate, or terbutaline. Some cats benefit from renal replacement therapy (RRT), such as peritoneal dialysis, intermittent hemodialysis, and continuous RRT. The latter 2 modalities are only offered at a few facilities, which are listed at queenofnephrons.com. Monaghan K, Nolan B, Labato M. Feline acute kidney injury: 2. Approach to diagnosis, treatment and prognosis. J Fel Med Surg 2012; 14:785-793. Many species of animals have renal secondary hyperparathyroidism—an increased concentration of plasma parathyroid hormone (PTH) levels associated with chronic kidney disease (CKD). In cats with azotemic CKD, prevalence is reported to be 84%. PTH maintains calcium homeostasis in the normal cat, while cats with CKD have a decreased glomerular filtration rate (GFR) that results in phosphate retention. The retained phosphate forms complexes with ionized calcium; the resulting decrease in ionized calcium stimulates PTH secretion. Elevated PTH levels cause renal osteodystrophy and soft tissue calcification; affect glucose and lipid metabolism; and contribute to immunosuppression, anemia, and other dysfunctions. When treating cats with CKD, managing the effects of renal secondary hyperparathyroidism is important. Clinically normal geriatric cats (> 9 years) that had plasma creatinine concentrations < 2 mg/dL were followed for 12 months. At this point, the cats were categorized into 1 of 3 groups: group 1 (35 cats) had plasma creatinine concentrations ≤ 1.6 mg/dL; group 2 (52 cats) had plasma creatinine concentrations > 1.6 mg/dL but < 2 mg/dL (or if levels were greater than 2 mg/dL, urine specific gravity [USG] was > 1.035); group 3 (31 cats) had plasma creatinine concentrations of ≥ 2 mg/dL and USG < 1.035 (or persistent azotemia for at least 2 consecutive visits). At the beginning of the study, the median PTH levels in group 3 were significantly different from those of group 1. At the end of 12 months, hyperparathyroidism was diagnosed in 0 cats in group 1, 3 cats in group 2, and 11 cats in group 3; the median PTH levels in group 3 cats were significantly higher than those in groups 1 and 2. During this study, 11 of the group 3 cats that developed azotemia had elevated PTH concentrations at the 12-month observation but no detectable differences in calcium or phosphorus levels. The results of this study suggest that renal secondary hyperparathyroidism can develop prior to azotemia, and phosphate and calcium levels may not be substantial factors in its development. Finch NC, Syme HM, Elliott J. Parathyroid hormone concentration in geriatric cats with various degrees of renal function. JAVMA 2012; 241:1326-1335. Cats are thought to be resistant to infection with Leptospira species but this report describes 3 confirmed cases of cats naturally infected with leptospirosis. The first case in the series describes a 1.5-year-old male domestic short hair presented for a 2-week history of polyuria (PU) and polydipsia (PD). The cat had access to the outdoors and, a few months prior to presentation, had been adopted from an over-populated, rat-infested shelter. He had been vaccinated at time of adoption. Urinalysis results were within normal limits other than a urine specific gravity (USG) of 1.005. A modified water deprivation test was initiated based on a presumptive diagnosis of psychogenic polydipsia. However, the cat became lethargic and anorexic, and was presented to a referral center. Although he was estimated to be 5% to 6% dehydrated, USG was 1.007. Treatment with antibiotics, vitamin B complex, and potassium chloride was initiated. 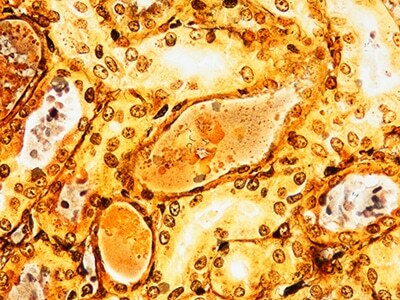 Leptospira serology revealed a positive titer of 1:12,800 for L Pomona. The second case describes a 9-year-old cat with a 10-day history of PU/PD and a history of unilateral uveitis, which was being treated. He had been known to hunt rodents both inside and outside but had been confined indoors for the previous 5 months. Three weeks prior to presentation, he had developed moderate lameness of the right forelimb. Urinalysis demonstrated a moderate number of erythrocytes; moderate amount of lipid, renal, and red cell casts; proteinuria; and USG of 1.036. Serum urea and creatinine were elevated. On day 19, Leptospira serology showed a titer of 1:1600 for L pomona and L bratislava, and 1:800 for L grippotyphosa. The cat was treated with antibiotics and placed on a protein-restricted diet. Convalescent titers taken on day 30 were 1:1600 for L pomona, 1:400 for L bratislava, and 1:100 for L grippotyphosa. Three years after initial presentation, the cat still developed intermittent uveitis, but there was no evidence of renal insufficiency. The third case describes a 3.5-year-old cat that presented with a short history of lethargy and anorexia. Over the previous months, the owners had reported weight loss and PU/PD. He had mild neutrophilia and lymphopenia, and moderate thrombocytopenia. Serum urea, creatinine, and phosphorus concentrations were elevated and bicarbonate level decreased. The cat’s condition deteriorated despite supportive care and it was humanely euthanized after several days. Serology titers were 1:3200 for L pomona and L icterohemorragiae, 1:1600 for L bratislava and L autumnalis, 1:100 for L grippotyphosa, and < 1:100 for L canicola. The cats in these cases presented with various stages of renal insufficiency, with no evidence of concurrent disease, including feline immunodeficiency/leukemia viruses, thyroid disease, or toxoplasmosis. These cases demonstrate that cats may develop clinical signs of leptospirosis. Further confirmation of renal infection with leptospirosis would require identification of the organism in the urine, or in the kidneys on histopathology. A prospective study evaluating seroprevalence and carrier state of cats with renal insufficiency is needed to evaluate whether this disease is currently underdiagnosed. Arbour J, Blais M-C, Carioto L, et al. Clinical leptospirosis in three cats (2001-2009). JAAHA 2012; 48:1-5. Woo PCY, Lau SKP, Wong BHL, et al. Feline morbillivirus, a previously undescribed paramyxovirus associated with tubulointerstitial nephritis in domestic cats. Pro Nat Acad Sci Early Ed, March 19, 2012.